Back in the 1940s, several model railroad manufacturers began to offer all-metal (or almost all metal) freight car kits. Some had separate sides, ends and roof which were assembled to a sub-body; some, such as the first Varney metal kits, had each side plus end as a single pressed metal piece; and of course there were cast white metal kits of several kinds. Some of the all-metal kits were carefully scaled to prototype cars, such as the Thomas Trains tank cars I have discussed in previous posts (for example, see: http://modelingthesp.blogspot.com/2012/07/thomas-industries-ho-scale-tank-cars.html ). In the present post, I want to discuss Athearn and Globe. Athearn has long been a giant presence in model railroading, particularly in my own scale, HO. It’s well known that founder Irv Athearn got his start in the 1940s and ran the company himself for many, many years. But origins are less clear. Originally Irv Athearn was a retailer of model train products, not a manufacturer in the beginning. He didn’t begin to offer products of his own until 1948. But on July 2, 1951, he purchased Globe Models of Chicago, a producer of freight car kits with wood substructures and metal shells. Typical model railroad legend has it that Globe had already produced a styrene F7 locomotive body, and that Athearn wanted that product. But in fact, that plastic F7 was not introduced until 1954, long after the purchase of Globe by Athearn, and the Globe name was simply used for the new product. 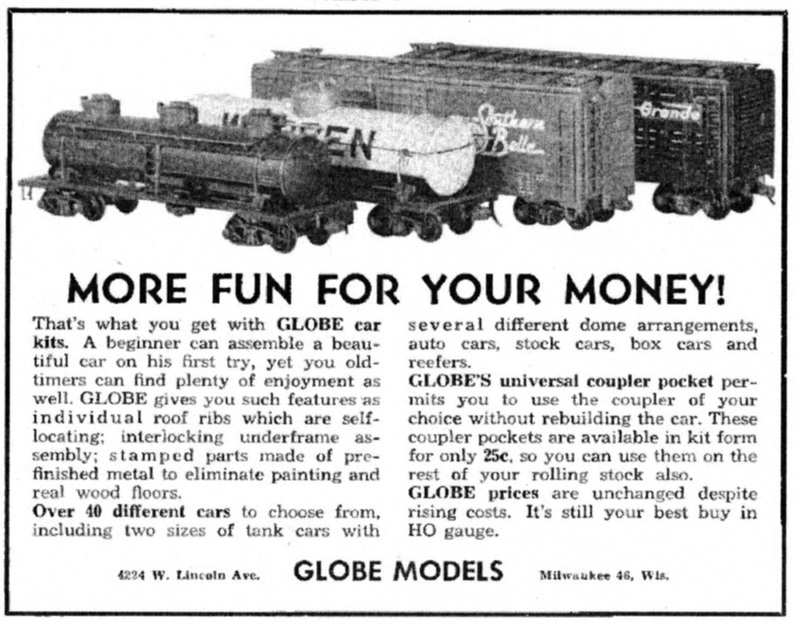 It’s often said, and may well be true, that Athearn wanted to see if plastic models would be accepted, and the Globe name was a “stalking horse” to test the idea, without any blowback on Athearn if it proved unpopular. 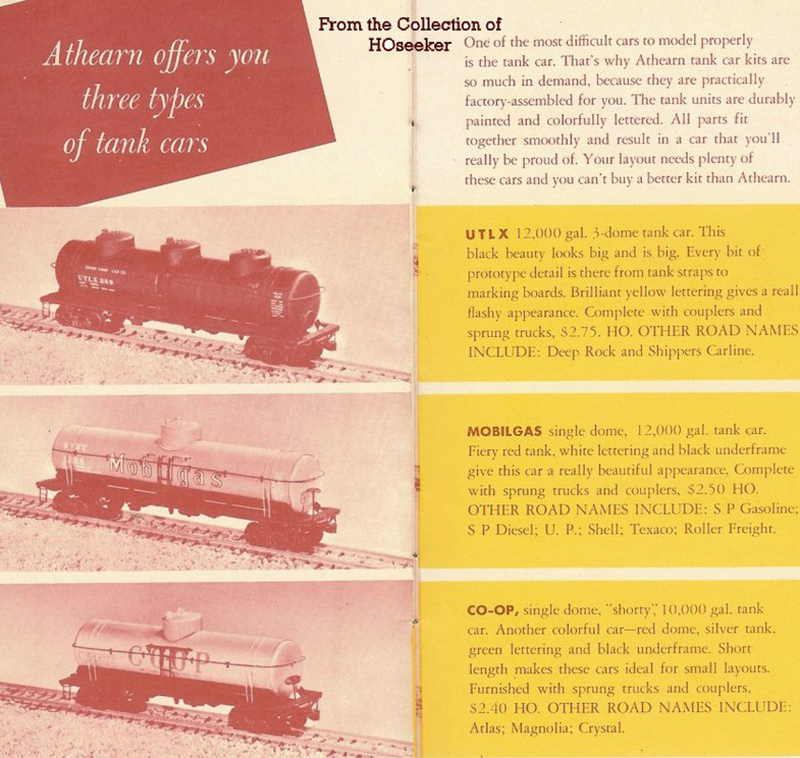 Athearn had a strong reputation at the time for its metal freight car kits. But who was Globe? Begun in 1942 by Frank Taylor, who had served as editor of Model Railroader magazine, and Carl Traub, a well-known model maker and scratchbuilder in O scale, it was originally located in Milwaukee (at 4224 Lincoln, Milwaukee 15) before moving to Chicago right at the end of business. They made both O scale and HO scale models, and were among the pioneers in the latter scale. Most of their house car kits were assembled by building a wood box, to which stamped metal parts were attached. Roofs, sides, and ends were all separate pieces. At the outset, their freight car line in HO comprised box, automobile, refrigerator and stock cars. (There were even aluminum box cars with real aluminum sides.) The only Globe catalog I could find on the internet showed only those car types. But later they did add tank cars to the line. The tank cars are clearly called out as 8,000 gallon and 10,000 gallon sizes. Note also the recently released stock car. Meanwhile, Athearn had also introduced its own metal tank car kits. But they were larger, about 12,500 gallons. Though their catalog called them 12,000-gallon tank cars, measuring the actual models proves them to be 12,500 gallons. 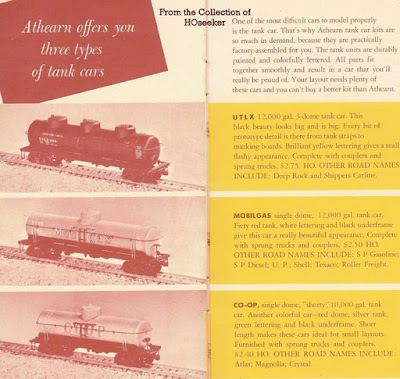 Here is a page from the 1948 Athearn catalog (found on-line), showing these tank cars. Again, you can click to enlarge. I have a couple of these Athearn cars, easily recognized because of their large tanks, and two of the Globe cars, equally easy to recognize because of their smaller tanks. Both companies had construction style differences from the tank cars offered by Thomas Trains (as described in a prior post, which is at the link shown in the first paragraph of the present post). Shown below are two Athearn models, a single-compartment car and a triple-compartment car. Both tanks measure out to 12,500 gallons. Note how much bigger the domes are on the three-dome version than on the later plastic car of this size that Athearn produced. The foreground car has lost its trucks, and the background car has lost its hold-down tank bands, but both could be restored, if I chose to do so. But the three-compartment car has no prototype, and I cannot find that Mobil ever had a 12,500-gallon tank car. Moreover, there are easier routes to a single-compartment car of this size (as I have noted in a post awhile back: http://modelingthesp.blogspot.com/2011/05/modeling-sp-tank-cars.html ). 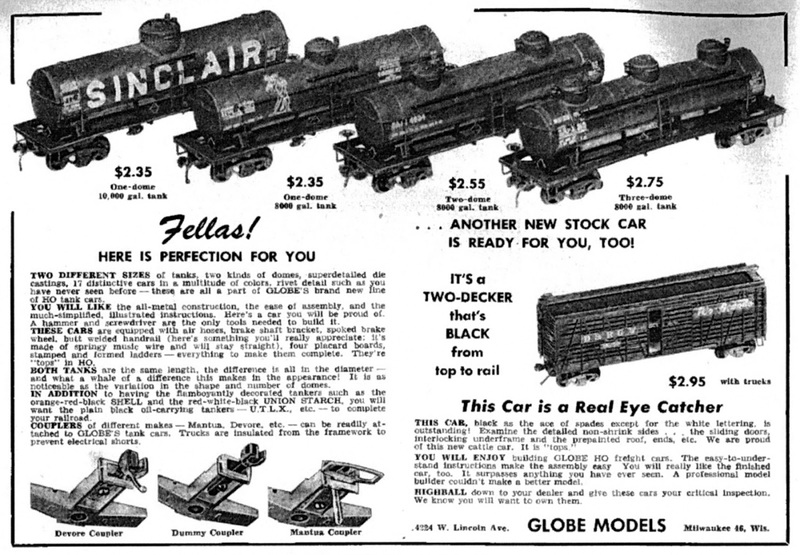 The last Globe ad I could find in Model Railroader was in the March 1951 issue (Athearn bought them in July of that year). It shows two of their tank cars and two box cars, and is smaller, 3 x 4 inches, perhaps reflecting financial stringency in the last months of Globe. As far as I can determine, Athearn did not continue to produce any of the Globe models after the purchase. Shown below is the Globe tank car I have, which is lettered SHPX 312, and still with the Mantua loop couplers it had when I bought it. The model is at least 65 years old, maybe more. It originally had elbow safety valves on each dome (as is visible in the ad above), but two of them have broken off and would have to be replaced. Paint would of course need to be touched up. But whether I will do a restoration remains to be seen.Today Tangent offers an excellent model of an 8000-gallon tank car with three compartments (though different proportions than the Globe model), and Southern Car & Foundry has an excellent three-compartment resin model also, so there is not much incentive to work on this model — other than its genuine historical interest. It is fun to research these old models, to help understand some of the classic HO cars I have picked up from time to time at swap meets. But whether or not to restore them is an entirely separate issue. I am not yet sure if I will restore the Globe model, and definitely would not restore the Athearn metal tanks. I just enjoy owning these old soldiers. I've got one of the Globe 8,000 gallon, single dome cars, lettered for Hercules Powder. As you note, they're not up to today's standards, but they are nice little models, especially for their time. Wow! A "hammer" needed for assembly of the Globe metal kits. Was that for some type of rivet construction? Certainly one wouldn't ordinarily think of a hammer needed on today's kits, save for maybe steam locomotive valve gear assembly. Actually, many of the early metal kits had parts that were riveted together, thus the hammer. Several kits were designed for the coupler box lid to be riveted onto the box after inserting the coupler. Not ideal for maintenance.